It's that time of year. I'm never ready for it, but then, one day, it's suddenly upon me. Watching TV via the Internet is great for me. I watch everything on demand, and, if I want to catch up on a show I haven't seen, I can binge-watch. Kinda like what Frank J. did with Breaking Bad recently. And, this year like every year, in December, I am caught up on previous seasons of current shows. Still some current shows airing, of course, which I can watch on Hulu Plus or buy a la carte from Amazon or iTunes. But, previous seasons of New-To-Me shows? I'm caught up. So, that's when I start looking for older shows. Shows that are no longer on the air, but I never watched, but I heard are good shows. That's how I watched Battlestar Galactica (the 2005 version). I was all caught up on everything else, and said "Hey, what the heck." And, I liked it. Got weird at the end. Jimi Hendrix weird. Overall, though, I liked it. Well, it's that time of year again. And, I've been hearing how great Doctor Who is. So, maybe I'll watch that, I thought. Just kidding. I had no desire to watch Doctor Who. I remember Doctor Who from way back. Used to catch an occasional episode starring Tom Baker on PBS many years ago. I thought the whole thing was silly. Not Monty Python silly. Just silly. But, I kept hearing about how great Doctor Who (the current version) was. So, I looked into it. And, I found out it wasn't really a reboot, but a revival. They kept the original timeline in place, and began the 2005 series with the Ninth Doctor. Mmmkay. Maybe this won't be the JJ Adams-ing of Doctor Who. Maybe I would watch it. But here's the thing about me. I'm the kinda guy that will watch something from the start. I won't watch a Part 2 without having watched Part 1. A few years ago, I decided to watch all the Academy Award® Best Picture films (along with other movies considered the "best"). I got to the two Lord of the Rings movies. Lord of the Rings: The Return of the King won Best Picture. Now, I could just watch that and meet my goal. But that's the slacker way of doing things. No, I had to watch the first two movies in the trilogy first. And I hated each and every minute of it. Yes, I know, a lot of people -- good people -- love those movies. But not me. What's that got to do with Doctor Who? Well, there were 26 seasons before the Ninth Doctor. 26 seasons. That's, like, more than a dozen. Almost two dozen. And, 20-30 episodes per season. Sometimes more. So, to watch it? Or not? I still thought the whole thing about the TARDIS looking like a Police Call box was kinda silly. But, then I found that Hulu was carrying many of the old classic episodes. Including many, many more than you can find on Netflix or Amazon. So, I started watching the episodes. And, lo! and behold! There in the first serial (4-episode "An Unearthly Child"), I get the answer to why the TARDIS looks like a Police Call Box. Kind of an obvious answer, but one that I never picked up on before. 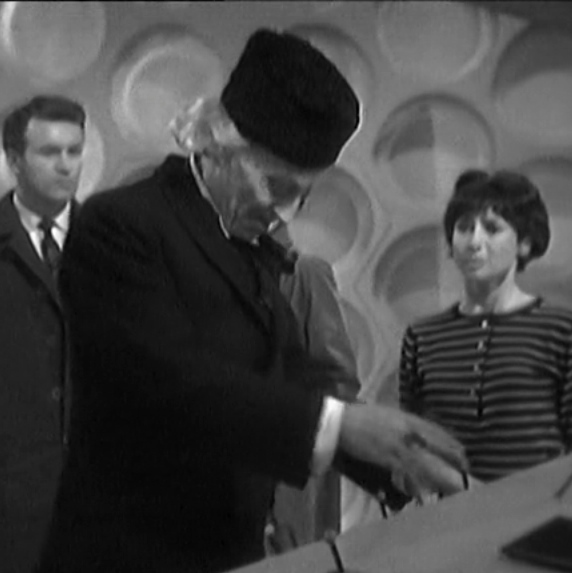 Now that the TARDIS appearance issue is resolved, there's no reason to not watch them all. All 26 seasons. At least, of the episodes that are available. That's still a lot. And, it's perfect timing, too. I've met the First Doctor, his granddaughter Susan, and the two school teachers The Doctor kidnapped. And, I'm expecting to meet his other relatives, including Cindy Lou Who, who's not more than two, in the upcoming shows. I hope I'm not disappointed. I had a similar experience with Doctor Who - I'd catch the occasional Tom Baker episode, but never really got hooked. All I remember was... it had more interminable, pointless walking scenes than a Roger Corman film festival. If you find any redeeming qualities in the series, please share. After one season, I'm not seeing anything that would cause someone to confuse it with a Michael Bay film. But, it's held my interest. I think you could skip the pre 2005 Dr. Who and start with the new stuff. Then go back if you like it. Some of the REALLY early stuff is hard to get through...even for the die hard fans. Especially the first 2 doctors. its interesting from a historical perspective but the shows weren't that good. Jon Pertwee is where the show gets watchable. the Tom Baker stuff is pretty entertaining. the show has been on for a very long time and for the most part written so someone can jump in and watch it without having to go through 40 years of backlog. The new stuff is quite a bit more story driven than it used to be. As for Torchwood....it starts off as a decent show but then just gets really really gay (and I really do mean gay) and stupid. the show went to some pay network after a few seasons hoping to drag the Torchwood audience with it....it didn't. The 2005 forward are very good. No real need to know a lot of complicated stuff about Doctors 1-8 to enjoy it as the tend to reference very litte at to stuff that happened before the ninth doctor. Amazon Prime and Netflix both have classic Doctor but they dont have all the episodes so there are some huge gaps. I too went cable free. Our internet is provided by a cable company so we get local channels mainly for local news (all other news I get through the magic of the internet) and stuff but we run Amazon Prime and Netflix through a Roku box. They keep a good mix of new and old stuff. I enjoy sharing old shows I used to watch with my kids. Cable can go pound sand for all I care. I agree with Blarg about torchwood. Avoid it like a plauge. My wife and I went cable free about 6 months ago because we decided that there wasn't anything on cable worth paying $100 a month for and quickly discovered that we don't really miss TV. The only thing we really missed was NASCAR coverage and with all the BS this year (rampant cheating and another Jimmie Johnson year) we didn't even miss that...already saw that like 5 times. It gets old. We get a couple of free OTA channels that show Hogans Heroes and such which are great to fall asleep to but for the most part we took up non TV activities and never looked back. The Doctor is the best thing on television. So far as Torchwood... after you become addicted to Doctor Who and run out of episodes to watch give it a try, but he aint lying about it being gay. As in hot man on man action. i have not gone quite cable free yet, but i have found the way to get the sports, including motosports, that i want. there are a couple of others, too. this is the one i use most of the time. never download anything, just use the links. Basil - If you haven't watched it already there's a network show from 1995 on Hulu Plus called "American Gothic" that you might like. Good and Evil contend for the soul of a young boy in a small southern town. Great cast - interesting concept - thought provoking situations. I will give that one a look. Thanks! Stargate SG-1 Hokey at parts but merican! And has Richard dean Anderson. Also Atlantis was a good follow on @200 episodes per series and my favorite after firefly and battlestar. Wow. Should have used a few more punctuation marks. My next lesson, don't smoke crack. I recently watched all episodes of THE PRISONER with Jim Caviezel on iTunes. Of course nothing beats the original British show with McGoohan. Oh yeah the second season of American Horror Story is really good. The seasons are not built on each other they are all individual, different settings and characters. The second season plays in an Asylum. Pretty cool cast, well played. Remember when men used to play sports? Let It Snow! Let It Snow! Make It So!